Today’s mobile data collection environments are a nonstop series of challenges, and a nonstop quest for efficiencies. Having the most capable tools in your workers hands allows them to maintain productivity and stay on track. The Marathon field computer was designed to replace multiple devices with one ergonomic, easy to use solution that eliminates the cost of purchasing and maintaining both laptop or desktop computers and a handheld device. The 7” touch screen display, laptop style QWERTY keyboard, numeric keypad, and optional data capture capability enhance worker productivity and reduce the number of costly errors. Further, the rugged design reduces down time and the total cost of ownership in the most demanding environments. Supporting Windows Embedded Standard, Windows XP Pro and Windows 7 Pro with mass storage to 64GB SSD, the Marathon also seamlessly integrates with enterprise applications and management systems. The new Marathon WWAN offering supports both 3.75G GSM and CDMA EVDO through a software configurable radio. Combined with 802.11a/b/g/n wireless local area network (WLAN), the Marathon WWAN enables anytime, anywhere communication capability with GPS location services. Acquisition is the third major auto-identification and data collection company to become part of Honeywell. Honeywell announced that it has completed its acquisition of EMS Technologies, Inc., parent company of LXE. EMS is a leading provider of connectivity solutions for mobile networking and rugged mobile computers. The acquisition will enhance Honeywell’s existing capabilities in rugged mobile computing technologies. EMS’s Global Resource Management (GRM) division provides highly ruggedized mobile computing products and services for use in transportation, logistics, and workforce management settings as well as secure satellite-based asset tracking and messaging technology for search and rescue, warehousing, and field force automation environments. Honeywell Scanning & Mobility was formed in 2008, following Honeywell’s acquisition of two leading manufacturers of automatic identification and data collection (AIDC) solutions, Handheld Products and Metrologic Instruments. Honeywell today announced that it has signed a definitive agreement to acquire EMS Technologies, parent company of LXE, a leading provider of rugged mobile computers. EMS’s GRM division offers a broad range of solutions for supply chain logistics, mobile workforce management, and remote asset monitoring applications, supported by hundreds of partners worldwide. EMS’s proven mobile resource management solutions include LXE-branded rugged handheld and vehicle-mounted computers featuring multiple radio technologies and satellite-based global tracking and monitoring solutions for cargo, fleet assets, and personnel. The Thor is designed for enterprises using forklifts, cranes, trucks and heavy machinery in warehousing, ports, manufacturing floor, natural resource, and trucking/transportation applications. The Thor will begin shipping in April 2011. Thor’s processing platform is dramatically superior to all other CE vehicle-mount computers in processing speed, RAM and flash. 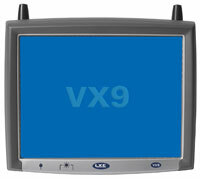 802.11 a/b/g and Bluetooth 2.0 comes standard, and by adding WWAN w/GPS (available in Q3), the advantage of Thor over other vehicle-mount computers becomes overwhelming. Cold Storage configuration, indoor & outdoor displays, and true space diversity antennas for WiFi, contribute to a device ready for virtually any industrial environment. LXE announced today the launch of the Tecton™ rugged handheld computer, targeting supply chain applications. 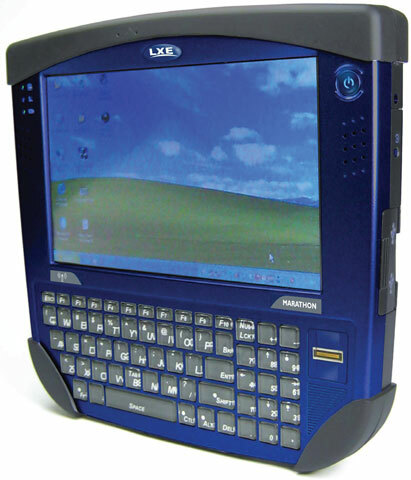 The successor to LXE’s highly successful MX7 handheld, the IP-65 rated Tecton handheld computer accelerates real-time data capture with an industry-leading PXA 320 806 MHz processor running Windows® Mobile 6.5 or Windows® CE 6.0. Lightweight and extremely well-balanced in the user’s hand, and with sleek design for an industrial tool, the Tecton handheld delivers its enhanced performance across a wide array of supply chain tasks. The unit’s multi-range scanning capabilities enable bar code reads from four inches to 40 feet, so operators can perform warehouse moves ranging from receiving to full pallet put-aways with the same version of the computer. Scan-intensive picking can be enabled with the Tecton computer’s available easy-grip removable handle with two-finger trigger, and every Tecton computer comes with LXE’s ToughTalk technology for voice-driven processes. The device also features a scan vibration signal that can be used to verify successful scans in loud warehouses, and multiple built-in data-entry options. Performance and versatility come with field-proven ruggedness and customizations for the most demanding environments. Keypads protect against airborne and spilled chemical agents, and electrical components are secured to circuit boards to better withstand drops and shocks. An available cold-storage configuration includes programmable touchscreen and scan window defrosters, and a cold-tolerant backup power source that holds a charge longer in environments as low as -30°C. LXE, the mobile logistics business of EMS Technologies, Inc., released two updates to its Trux line of rugged vehicle-mount computers. 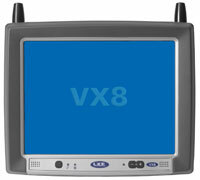 The VX8 Kärv and VX9 Förj vehicle-mount computers incorporate sharper LED backlit displays, Intel® Atom and Core 2 Duo processing speeds and mobile radio connectivity into rugged and versatile mobile personal computers. The two units are designed for enterprises that need full Microsoft® Windows® computing power in a mobile environment to optimize application and network management compatibility. The Kärv vehicle-mount computer is derived from predecessor products developed by the LXE’s Trux group in Sweden and its namesake was a small, maneuverable Viking ship used for both battle and merchant missions. It comes with available Atom 1.6 GHz or Core 2 Duo 1.5 GHz processors, and up to 2GB of RAM. A 10.4″ touch screen LED display, 802.11 a/b/g + Bluetooth radio, and available WWAN connectivity allow those processors to run high-performance software applications from virtually anywhere. The unit’s compact magnesium enclosure rated to IP65 is engineered to handle extreme temperatures, shock, vibration, dust and moisture. The Förj computer, with a name that alludes to the strong, precise materials, which emerge from a blacksmith’s forge, is the Kärv computer’s larger counterpart, with a 12.1” touchscreen and outdoor screen option. LXE Inc., the rugged mobile computer business of EMS Technologies, Inc., announced today the immediate availability of the MX9, MX9CS, and MX9HL Ultra-Rugged handheld computers, designed for use in a wide array of heavy industrial and outdoor data collection environments. “The MX9 family of handheld computers further extends LXE’s reach into new markets and outdoor data collection applications.” states Steve Newell, LXE’s general manager. Replacing the popular MX5 series of handhelds, LXE has incorporated improvements and additional functionality requested by its existing customer and partner base. “We have seen a growing demand for ultra rugged computing products. The MX9 computer offers best-in-class performance along with special features such as GPS receivers for positional location applications. Interest in the product for agriculture, forestry and public safety markets, among others, demonstrates the need for high-reliability handheld computing solutions. Adding the MX9 family of computers to our portfolio of products will greatly extend the breadth of LXE products made available to our growing network of partners, for use in their solutions offerings.” Newell added. The MX9 computer is in a class by itself, offering a host of features, including an outdoor display, multiple scanning and imaging options, back-lit keypads, built-in GPS positional location option, and 802.11 a/b/g, WWAN and Bluetooth communications options. The MX9 computer includes an IP67 rating and rugged packaging designed specifically for harsh outdoor environments. With low-temp batteries and built-in heater control capabilities, the MX9CS version of the handheld computer is ready for a variety of cold storage applications. The MX9HL version is compliant with Class 1 Div. 2 Hazardous Location environments. All MX9 computers ship with a PXA320 processor and industry-leading Windows® CE 5.0 operating system offering an open platform for application development. All versions also include LXE’s Toughtalk technology, supporting voice recognition applications.